"It appears to be Garamond (or similar) and not Jeffrey Matthews font - the gap at the top of the 4 is very noticeable. I agree this is probably another Royal Mail concoction, just like the panes on your website which have no elliptical perfs, but it is odd that the others seem to use the correct font." 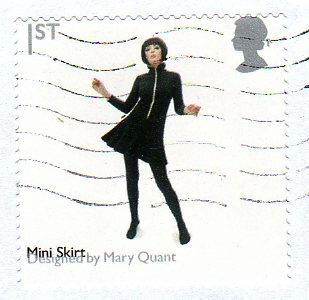 It is not uncommon for Royal Mail to produce pre-issue publicity pictures which vary from the actual stamps - see the publicity image here. The 54p seems quite normal in that picture. So, Chris, you were right after all! And another thing I can confirm, the Album Covers special stamps on panes 2 & 3 are NOT self-adhesive but ordinarily gummed. 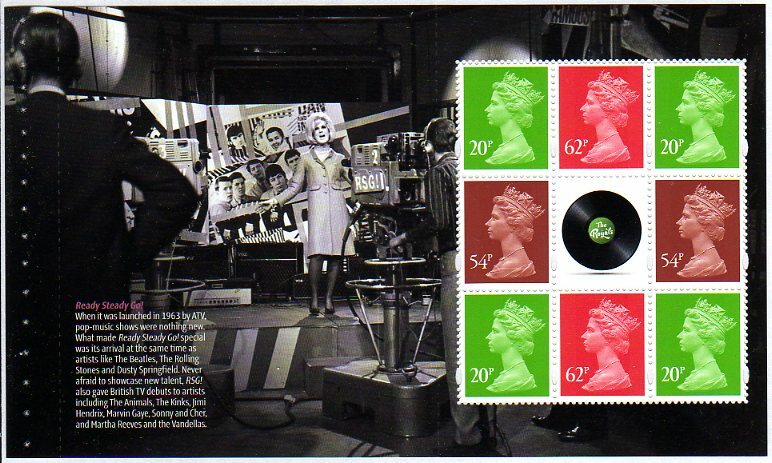 The phosphor block, as on the Souvenir Sheet extends to the perforations, whereas on the self-adhesive sheet stamps the phosphor is only on the album cover. This is the last blog post before we break for Christmas. Season's Greetings and all the best for 2010 !! Now, the 2nd class Machin with 4 security slits. Following our report of the 1st class Machin stamp appearing in kiloware with four security slits we have now been sent an image of the 2nd and 1st with four slits. (b) they have been through mechanised sorting unlike most of the other odd-ball security Machins which have packet handstamps. Both these and the previous 1st class (shown again below) have very flat 'tops' to the perforations, similar to, but possibly flatter than, the Walsall stamps in mixed booklets, and are probably from business sheets. But their real origin remains a matter of speculation. We still await any reports of these found unused. Holiday time brings charity appeals - check them for coils! Although charities send appeal letters and newsletters to their supporters throughout the year, Christmas is an especially productive time as we are all feeling generous and more likely to respond positively - at least that's the idea. I had an appeal letter from MND Association, Box 45 Diss. It's one of those that uses imitation handwriting for the address and the return address. More crucially for me - and for you - is that the mailing house that sent this out used a 2nd class coil stamp with security features. Yes, an MRIL! This is the first time I have seen one used, and it comes with the usual laser-print four wavy lines and no date stamp. Check your mail more carefully over the next few weeks - there may be some surprises! Let me know what you find! Security Machins with 4 security slits - trial, error, or forgery? Kiloware can be fascinating if you have time for it. This, like the earlier 1st class with no overlay, came from a packet which was manually sorted. 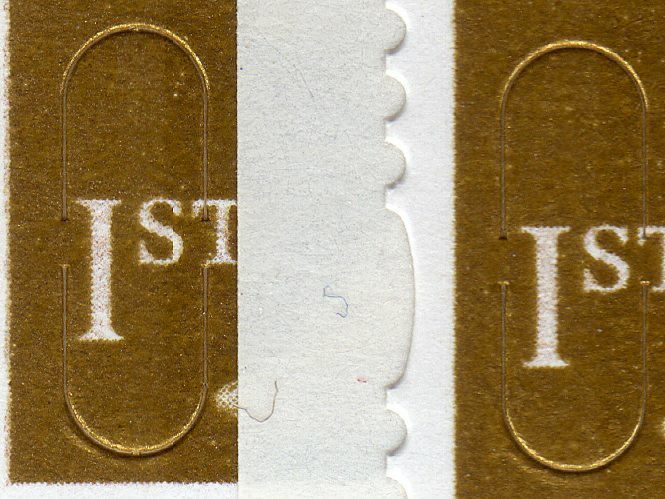 But we've also been shown both 1st and 2nd class with four slits, with wavy line postmarks indicating that they had been processed by the normal sorting machinery. All these have been found by a dealer in Asia. The no-overlay was postmarked Devon and Exeter and the 4-slits is postmarked Plymouth, which is in Devon. Machin specialists are rightly sceptical and suspicious and mint examples bought over the PO counter or from Royal Mail Direct are eagerly awaited! Founded in 1660, The Royal Society celebrates its 350th Anniversary in 2010 and as the National Academy of Science of the UK and the Commonwealth. It maintains its position at the forefront of enquiry and discovery, and at the cutting edge of scientific progress. The Royal Society still supports many top young scientists, engineers and technologists, and continues to influencing science policy and stimulating debate on scientific issues with the public. 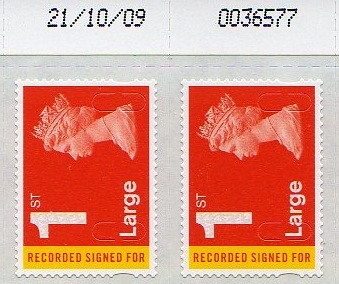 The stamps are not issued until 7 January. Orders which exclude first day covers will be posted as soon as possible after the issue date. Orders which include first day covers will not be despatched until we have them returned by Royal Mail after servicing, which will probably be the end of January. 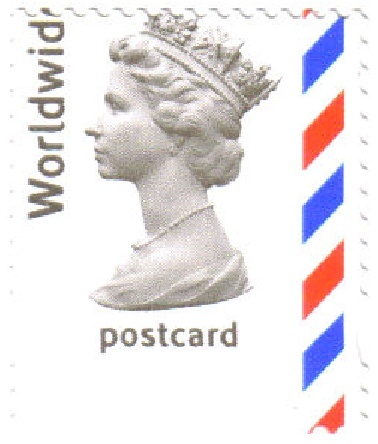 We are hoping to have the first batch of pictorial postmarks on the main website around 13 December. 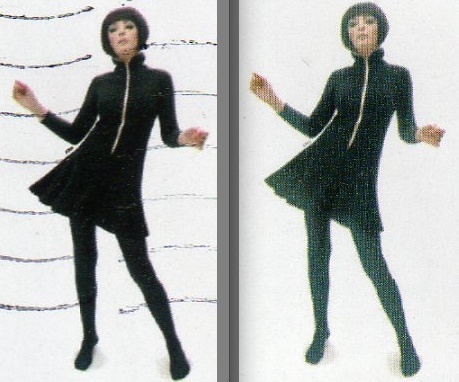 A while back I reported faded black on the Mary Quant booklet. That these are quite widespread suggests either a lack of care or a problem at the printers. Another error on the Quant booklet concerns an upward shift of the silver, putting the value and Queen's head into the perforations and the lowest (silver) caption line up to the black caption line above it. Again, there are more than a few of these about, I'm told. According to the Bureau Stock List received today, the following items will be going off sale on 16.02.10 - unless sold out earlier. Presentation packs for 01.07.03 High Values and the PIP pack will also be withdrawn. ... and Royal Mail will mark the anniversary not with a set of six stamps as it did for the Boy Scouts Centenary, but with a miniature sheet of 4 stamps which will see very little social use. Shame. The sheet will be issued on 2 February 2010. Printed by Cartor Security Print in lithography, the sheet is 190x67mm and the stamps 37x35mm. This is what they did for the boys - oh, and special postal stationery as well! Comments, girls? Supplies of the new Machin Recorded Signed For stamps have now arrived and the printing date blocks show why at Stampex Royal Mail officers could not confirm for sure, the colour of the stamps. At that stage - despite our cynicism! - they had not been printed (assuming the ones we have now were from the first printing batch. We have now seen printing dates of 16 and 19 October for the small stamp and 21 October for the Large stamp. 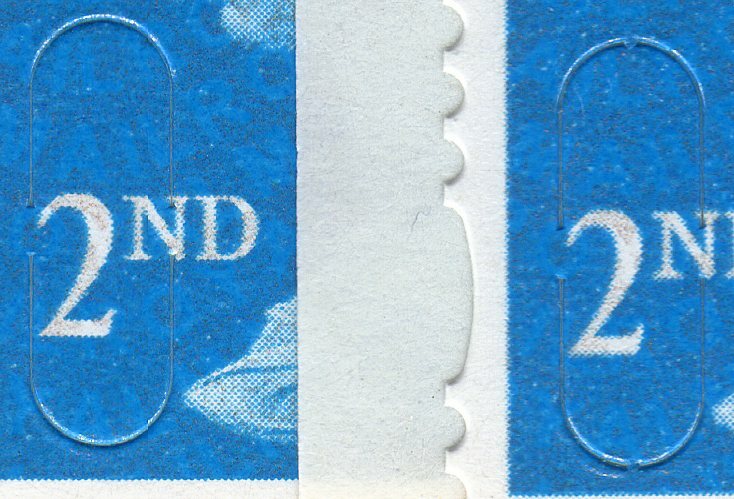 The Security Overprint is the same style as on ordinary sheet stamps, ie with no code, and the security slits are bisected by the smallest of 'nicks' which has been described as Type 2a. 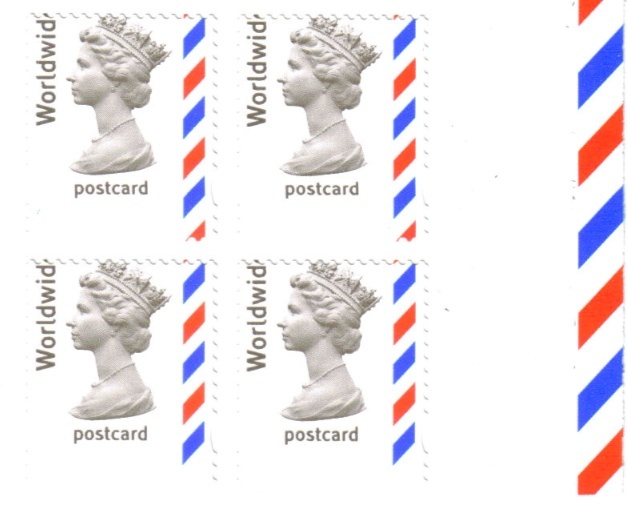 Cylinder blocks and first day of issue special postmarks are shown on our webpage here. Update on the Postcode Anniversary slogans which Royal Mail said would be applied at mail centres from 6-12 October and at Norwich from 5-18 October. I spent the last week on the Welsh borders and postcards posted in the Shrewsbury area received the ink-jet postmark as late as Friday 23 October and the old-style machine slogan at least as late as Tuesday 20 October (no images available). CFC 1 using Pass On with inverted date die on 12 October. CFC 1 still using Pass On on 26 October. CFC 2 still using Get the most on 23 October. CFC 3 still using Code it Keep it (pigeon) on 30 October (zero not visible on any copies). CFC 4 still using Sealed & Postcoded on 23 October. CFC 6 still using Help us push on 19 October. CFC5 not seen after due date. Non-CFC usage shown in the previous gallery has been seen only once, on a department store Mailshot. It might have been used only for that mailing. Gatwick Mail Centre IMP using the ink-jet slogan on 24 October (with Croydon w/l 'overprint'). South East Anglia IMP using the ink-jet slogan on 24 October. And Preston IMP using the ink-jet on 23 October - thanks Dave! We've seen no postcode slogans with November dates from Norwich, and other slogans have been used in at least some IMP machines, but of course we will publish any other reports here. No, it's not my error, the stamps actually are Worldwid Postcard stamps! 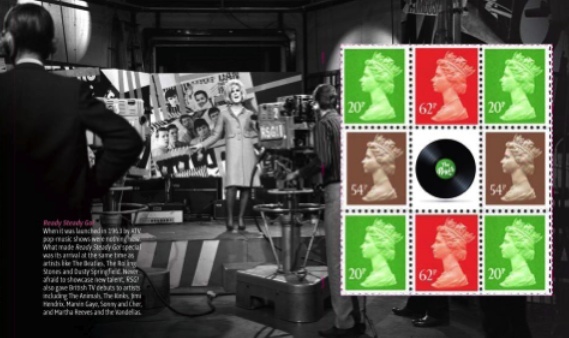 There is a very short band on the bottom stamps but a full band on the top stamps. I understand that two books were found -- which is not to say that there may not be 10,000 more out there waiting to found! As this is a plain (non-cylinder) book, I'm not sure if these are from the recent reprint from grey cylinder W3, but I think that they are. 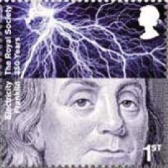 Unlike more recent sheet-printed stamps, the phosphor on these and the 40gr booklets was printed on the central matrix as well as the stamps, meaning that only the bottom row could have short bands at the foot, and only the top row could have short bands at the top. Even if this is a new printing, it would make sense for the phosphor cylinder on books of 4 to continue if possible. Undated 2009 Strike Mail - so that we don't know how long it took to arrive? Well the postal strikes are over for the present to enable negotiations to continue and for Christmas post to be dealt with normally, much to everybody's relief. Here's an interesting item we received this week from the the mid-Wales coastal area, which has been processed with no date in the ink-jet postmark! 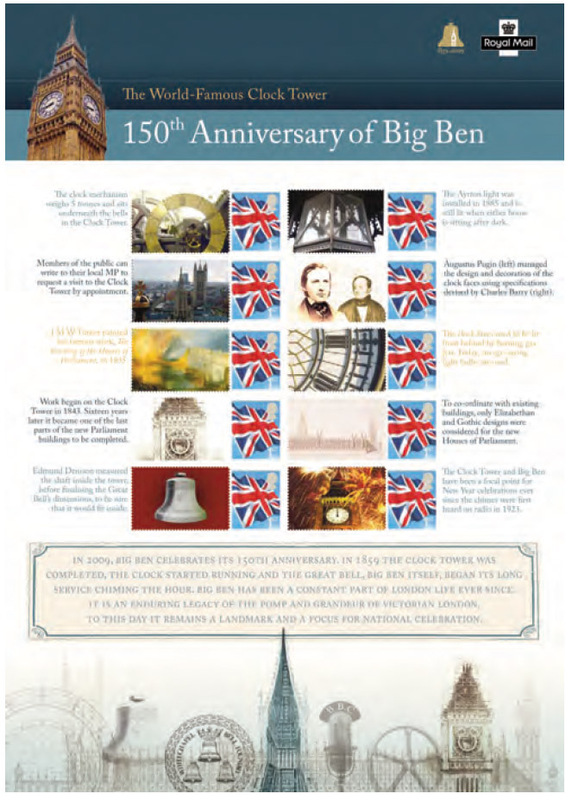 The Big Ben Commemorative sheet is self-adhesive with 20 definitive-sized Union Flag stamps, as shown. On the same day, Royal Mail sold a Philatelic Medal Cover, which included a commemorative medal (not coin) from the Royal Mint, with a special Smilers stamp, and special postmark. 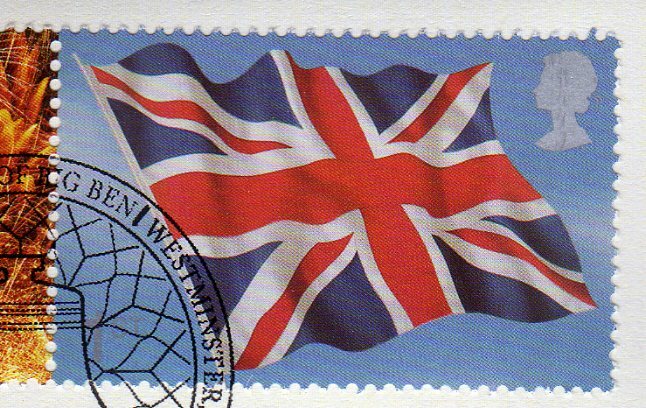 The Smilers label is in the same design as the final label on the sheet, but smaller - because the stamp is the large-size Union Flag on conventionally gummed paper. Whatever form it was printed in, this stamp was not available to collectors of dealers. 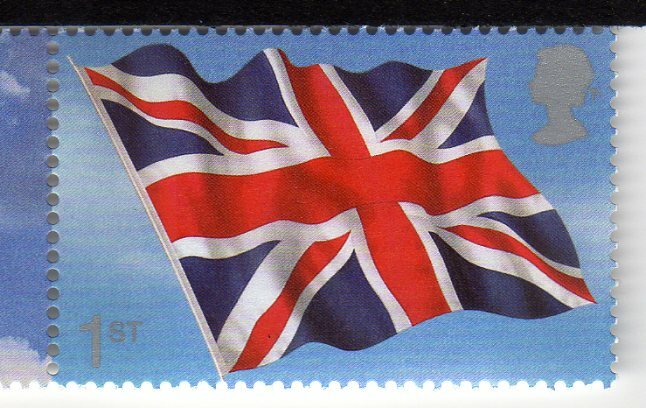 The perforation is the same as the Rule Britannia Smiler of 2004, but the shade is quite different. Cylinders on sheet stamps not yet seen. Smilers makeover- 4 new designs for consumers. 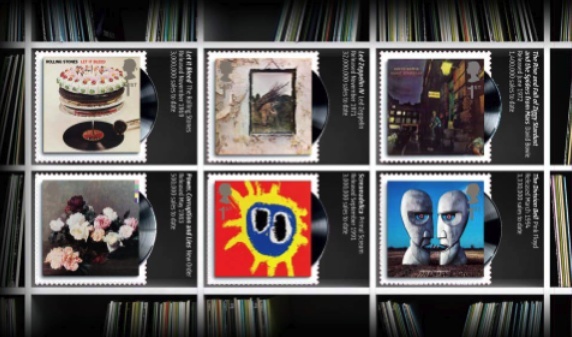 Royal Mail's Smilers (personalised stamps) service has been running since Stamp Show 2000 and over the years many stamps have been added and removed from the menu. 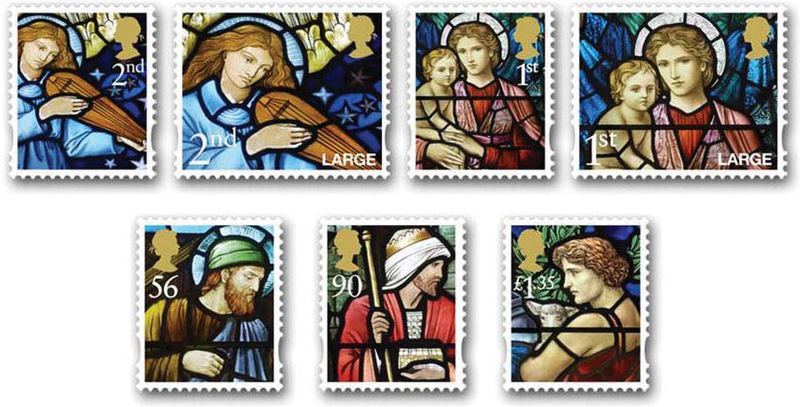 Many of the stamps have also been available in the Business Customised Service [BCS] (those expensive sheets which look like posters with stamps stuck on, which are sold for prices even higher than Royal Mail's premium-priced Commemorative Sheets). There will also be a self-adhesive generic sheet. As my headline says - 4 new designs for consumers, those on the right, which are two 1st class and 20 gr stamps for Europe and the Rest of the World. 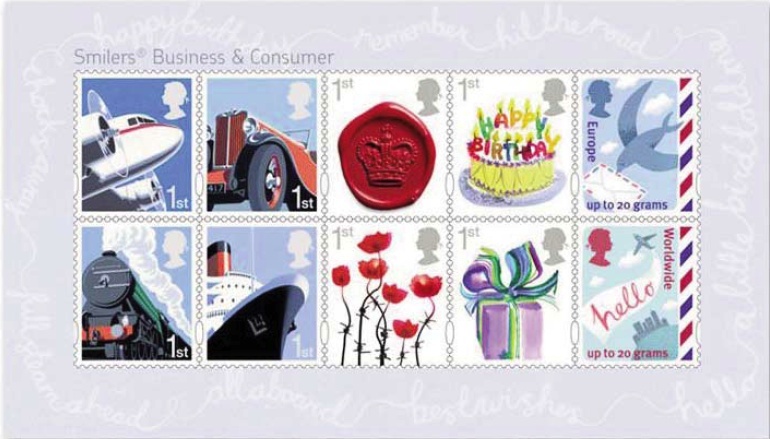 The left-most 6 stamps with themes of transport, remembrance and royalty are for the Business Customised service only at this stage. You can see more details of this in due course on our website. FDCs and special handstamps will be produced. 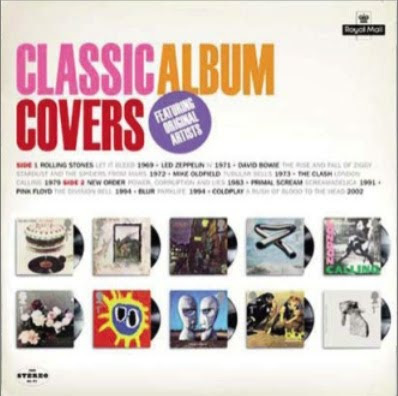 After the success of 2009’s British Design Classics, 2010 opens with a look at the classic art of the album cover. For decades the album sleeve has been the canvas for some of the most imaginative graphic artists in the world. 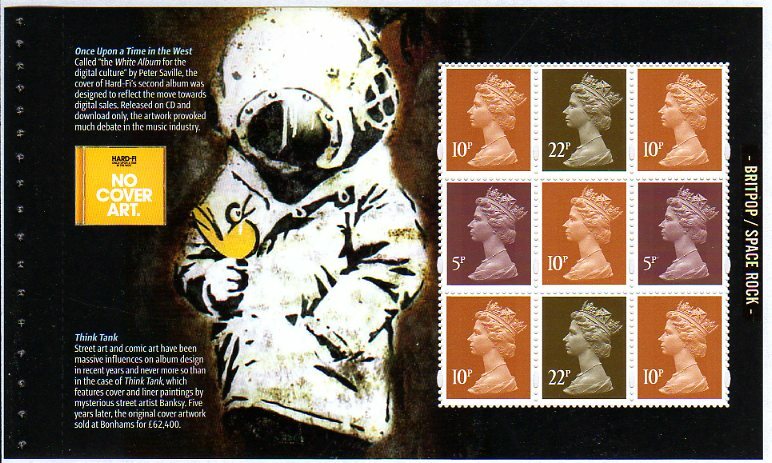 This stamp issue salutes this unique art form and celebrates some of the greatest examples, used by UK artists. Presentation Pack. 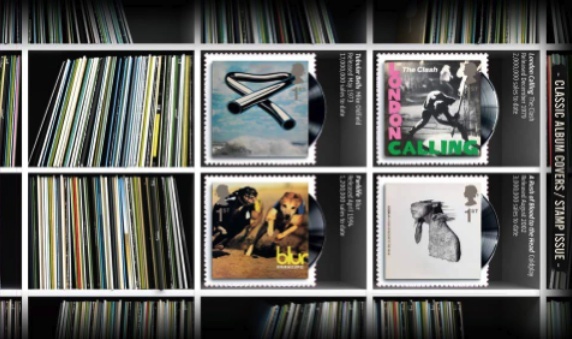 This is a fully illustrated folder which contains all ten Classic Album Covers Stamps. Stamp Cards - postcard-sized enlargements of the stamps, sold in complete sets only. First Day Covers (FDC) - special envelopes with designs to compliment the stamps. Prestige Stamp Books consist of pages of stamps interleaved with information about the subject. In due course we will add an ordering page which will include the ability to order any quantity and pay. Otherwise we will take email orders, through the website. Business Sheets: DLR die-cuts - just how significant is type 2a? I mentioned the two different types of die-cut arcs reportedly used by De La Rue on 1st & 2nd class business sheets earlier. Somebody asked me to get some of second type which has been labelled Type 2a by specialists. In the normally adequate light of the club meeting room last night I couldn't see any difference on the 1st class. 2nd class? yes, there's the gap but a smaller one than on Type 2 (hence 2a), but the 1st class? How big do you need to magnify it to be sure? Can we prove that this is a definite variety? 1st class - sorry, Type 2a on the left! Ok, how about these. They are scanned at 2400dpi and yes, I can see the gap! They go on sale in our online shop within the next couple of weeks! Royal Mail's Postmark Bulletin announced that letter cancelling machinery would have a commemorative postmark for a few days. 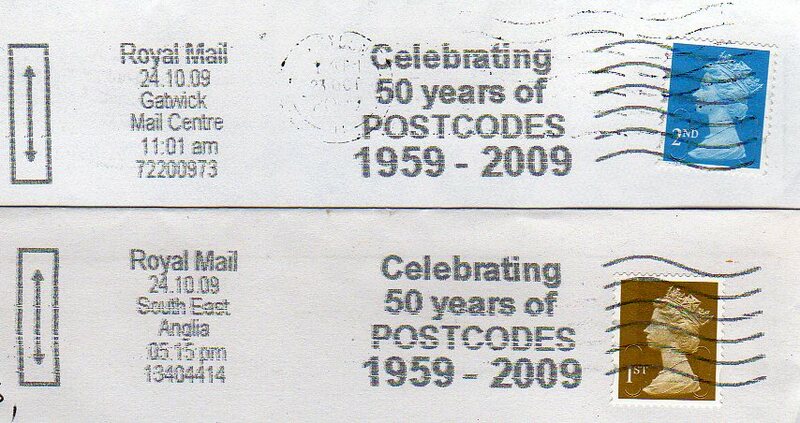 An ink-jet slogan marking the 50th anniversary of the introduction of postcodes at Norwich on 8 October 1959 will be used 6-12 October at mail centres applying ink-jet postmarks. A bilingual version is intended for use at mail centres processing mail posted in Wales. h - Sealed & Postcoded Correctly Addressed/Mechanisation/Will Do The Rest. Six of these eight dies are expected to be used in the three CFCs (Culler Facer Cancellers) dependent on operational requirements. This announcement is for information only. 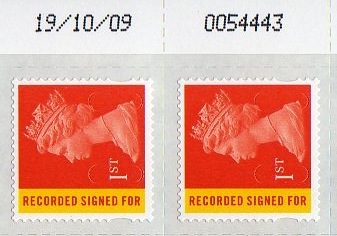 Collectors are reminded that Royal Mail no longer offers a reposting service for slogan postmarks. The slogan dies were supplied to Norwich from the British Postal Museum and Archive - it may well be that some of them were never actually used at Norwich in their first use. 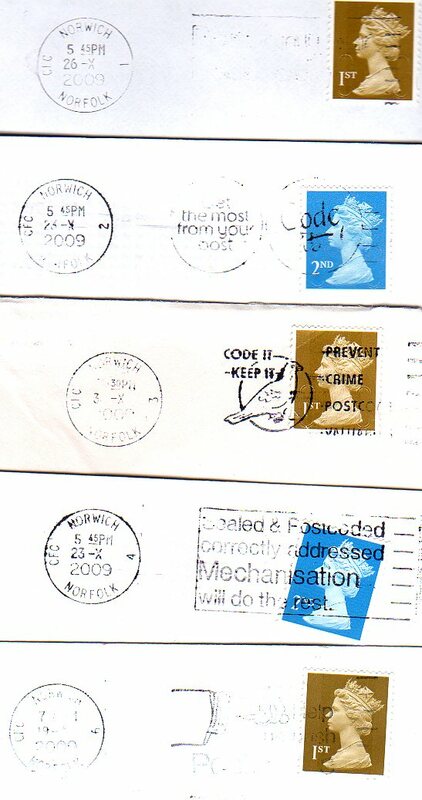 The Postmark Bulletin indicated that 8 dies were to be sent to Norwich which has three CFCs, each with two cancellers, so we wondered which would be used. Fortunately I've been supplied with incoming local mail from a local business and can report. Even more fortunately Norwich sorting office seems to have found some more ink - usually the postmarks are too indistinct even to read the date or placename! 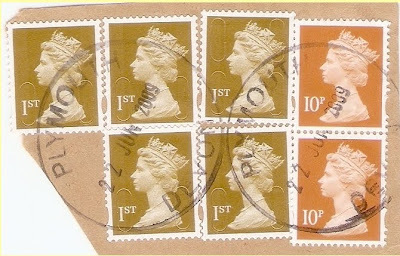 * Almost all mail posted in the Shrewsbury area receives two machine postmarks, one the old style and one the IMP (ink-jet). Getting these is quite unusual! Finally a copy of a much earlier slogan. Thanks to Stafford, Simon, Barry & Richard for information or examples of postmarks.